Looking for an EGG-FREE, MILK-FREE, GLUTEN-FREE, SOY-FREE, NON GMO VERIFIED AND VEGAN alternative to egg nog? It doesn't say it on the packaging, but I don't see any nuts in it either. I'm proud to say I found one! This is another tasty 'Limited Edition' Holiday Flavor from the makers of So Delicious. We love their yogurts and sorbets so I figured we couldn't go wrong this seasonal option. I'm happy to say I wasn't disappointed. 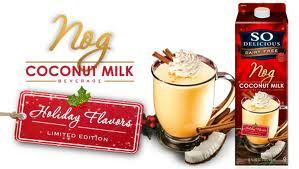 So Delicious DAIRY FREE Nog, Coconut Milk Beverage, distributed by Turtle Mountain, LLC., Eugene, OR, 97402. 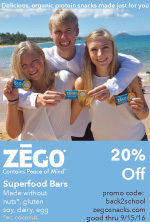 Ingredients include: ORGANIC COCONUT MILK (WATER, ORGANIC COCONUT CREAM), ORGANIC DRIED CANE SYRUP, NATURAL FLAVORS, ANNATTO FOR COLOR, KOSHER SEA SALT, CARRAGEENAN, GUAR GUM, LOCUS BEAN BUM, SPICES (NUTMEG). Their have four different links on their webpage. 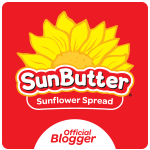 PRODUCTS shares more information in regard to their individual products; HEALTH discusses areas such as ingredient lists and product certifications; COMMUNITY refers to their contests, donations and event calendars; and, ABOUT US is their contact link. We've enjoyed this seasonal beverage during our holiday celebrations. Hope you like it too!